The team at Old Stone Vets has grown steadily since we started in 2005. We are all committed to giving you, the customer the best veterinary service we can. We constantly look for ways to improve our service and facilities, and welcome any comments you have in this regard via our contact page. Karl is the “old man” in the practice now. Jeez!. Graduated from Dublin actually in the last century, he started work as a mainly farm and equine vet in the west of Ireland. Many calvings, caesers, pints and good times later, he ventured across the water at the turn of the century to the UK. After just over a year in mixed practice in Norfolk, where he may have been responsible for some vehicular destruction, he came to the north east for Foot & Mouth Veterinary duties with DEFRA in mid 2001. Lots of locum work in the North of England for the next few years kept him off the streets until in 2005, Old Stone Vets became the main focus of all veterinary attention. 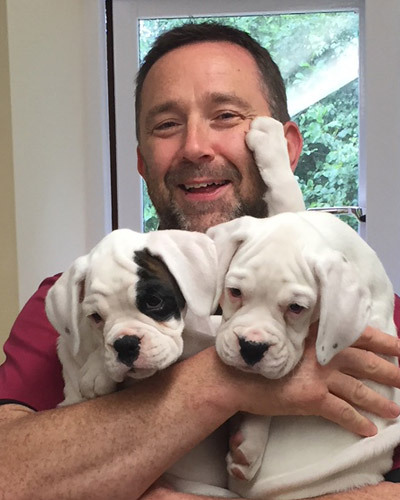 Since then with Rachel alongside, Old Stone Vets has expanded to the three site practice it is today, and Karl has an interest in all parts of the practice, from drain cleaning to orthopaedic surgery. 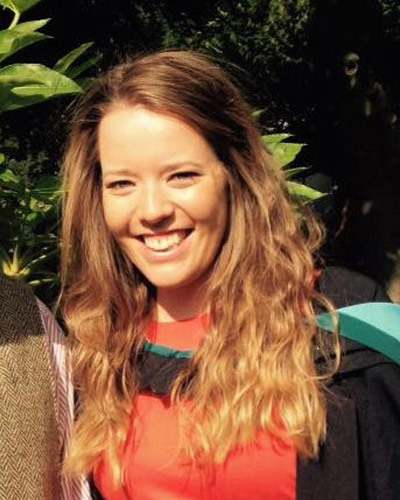 Rachel graduated from Edinburgh University and began her veterinary career in Scotland as a mixed practice vet, came down to the south of England afterwards for a few years as a mixed practice vet and locum vet in small animal and equine practices. 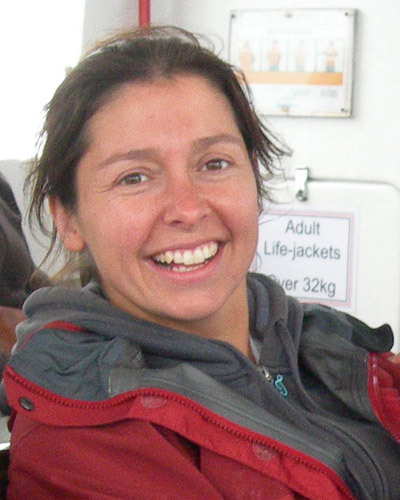 During Foot and Mouth in 2001, Rachel returned to her roots in the North of England to work for DEFRA. After this, with a newish husband in tow, Rachel continued with mainly small animal locum work in the North of England for a few years until Old Stone Vets had grown enough to provide gainful employment for both Rachel & Karl. Since 2007 Rachel has been the key driver of clinical progression at the surgeries, but still drinks the most watery tea known to man. Robbie born and bred in Glasgow, attended Edinburgh Vet School and graduated in July 2017. 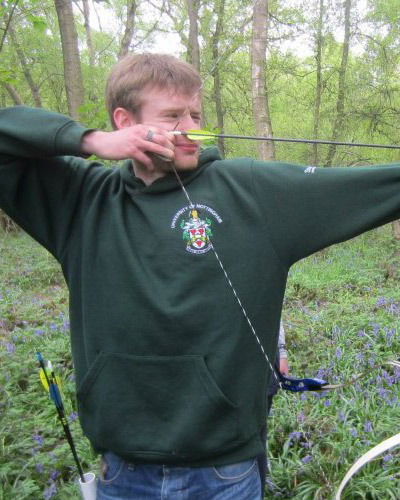 Robbie is a keen outdoor sports enthusiast including Kayaking, climbing, ski-ing etc. He joined Old Stone Vets in September and has a keen interest in all aspects of the job. Robbie is not known for his baking abilities, but is good at spotting a bargain in the local co-op for cakes and passing them off as his own!. Robbie is our fitness guru, trying to keep us all in shape, but we are poor students! Anna grew up on a small farm along the East coast of Northern Ireland. She’s a dab hand at lambing but enjoys all aspects of mixed practice life. Anna graduated from Nottingham University in 2017 and came to Old Stone Vets with her straight talking (when you can understand her!) attitude to veterinary life. Anna is a good hand at chocolate brownies, eating them as well as baking them. Jack is an Allendale native born & bred. 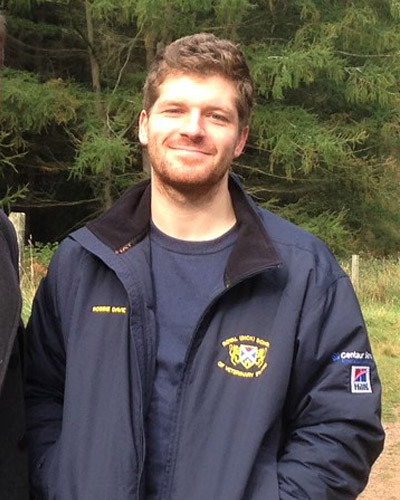 Jack saw practice as a student here with us at Old Stone Vets and after qualifying from Nottingham University in 2016, went on to mixed practice in south of Cumbria. Jack gained loads of valuable experience there and made the decision to return to his native Allendale locality, joining Old Stone Vets in February 2018. Jack is an avid rugby fan, and loves getting out and about on the hills walking. Our mission is to fatten him up while he is here. Cakes generally do that so it shouldn’t be a problem! 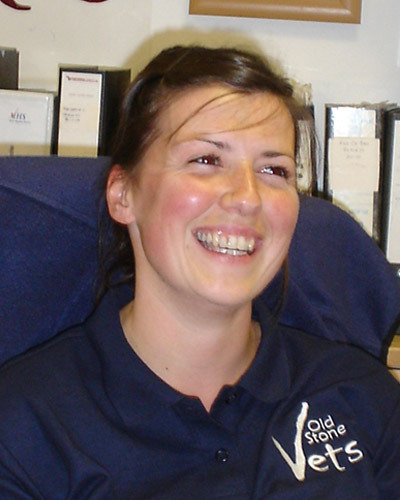 Victoria joined Old Stone Vets in 2010, when we opened the Stanhope branch of our practice. Victoria began duties as a receptionist, and has developed into the role of accounts manager alongside receptionist duties. Victoria ensures the office runs smoothly and ensures everyone’s holiday days are sorted, so we all make Victoria coffee every morning. Outside of work at the Vets, Victoria lounges about at home at her main passion in life which is farming pure Dairy Shorthorns at her parents farm in Weardale. 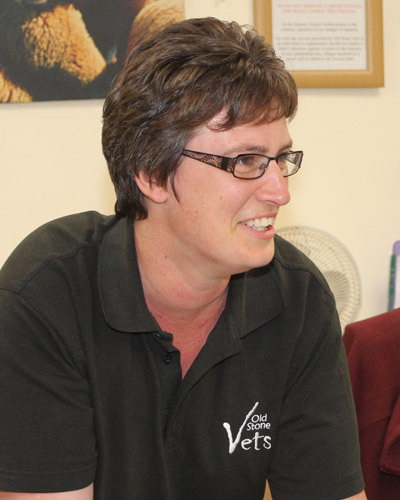 Jo, a qualified Veterinary Nurse, has previously been a nursing examiner, senior surgical nurse, worked in many veterinary hospitals, before finding her perfect job here with us at Old Stone Vets in 2012. Jo brings her unique brand of cynicism and wit to the practice and keeps all the vets in line while ensuring excellent patient care and nursing while in here in theatre or recovery. Claire is a born and bred Alstonite!. From farming background, Claire loves Alston Moor and knows just about everyone here. 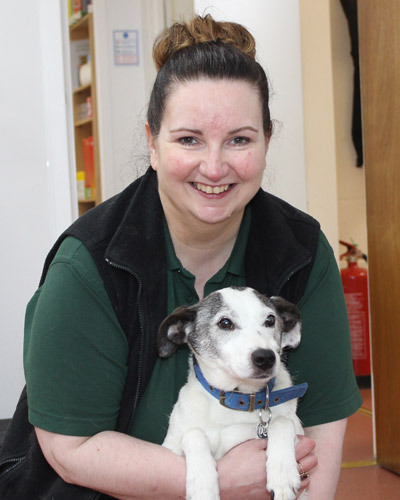 Claire joined us a receptionist but has also progressed into veterinary nursing assistant. Claire is always a welcome face at the desk, and really makes all the inpatients feel at home and special. Claire is applying to be a part time reserve fire fighter in Alston Moor, so she’s in training at the moment to be super fit! 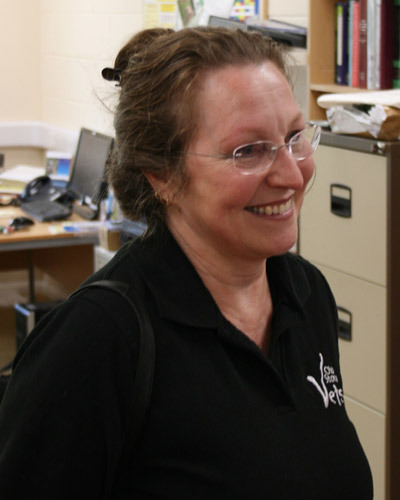 Denise lives in the Weardale and started working at the OSV Stanhope branch in 2012. Denise previously worked for the Police and so can be very authoritative when required (she keeps the Weardale farmers in check anyhow…!). Denise works mainly in our Stanhope branch, job sharing with Victoria. 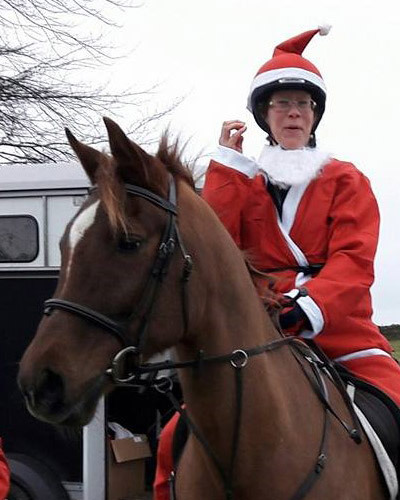 Denise has a horse, Spike, which she rides through the forest at Hamsterley (when he’s not wrapped in cotton wool to stop him hurting himself in the field!!). 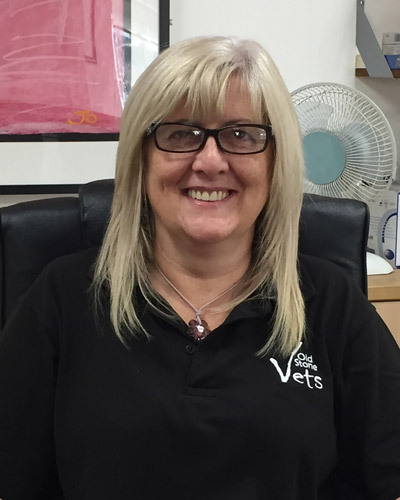 Crissy joined Old Stone Vets in 2012 as receptionist and is now based at all 3 surgeries depending on where we need her organisational abilities. Crissy’s off roading 4×4 abilities are second to none and demonstrates these on Killhope tops during winter months. Crissy thinks caffeine has driven everyone at Old Stone Vets do-lally so she drinks hot water just in case she follows the same path. Crissy has 2 St Bernards at home along with Stan the large rescue dog, and Crissy reckons large dogs are best because they don’t yap as much! Angela joined Old Stone Vets in September 2017. 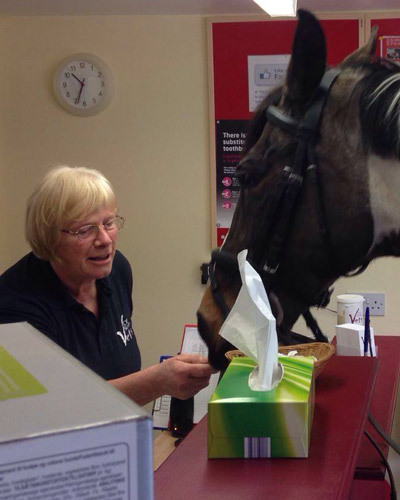 Having almost 20 years experience of being a veterinary receptionist in Newcastle, Darlington and Penrith Angela finally saw sense and took up employment at Old Stone Vets. Angela is from Slaley originally and seems to know about half the Allendale clients already. Splitting her duties between Allendale and Alston surgeries, Angela keeps us all in line with her dry wit and occasional death stares! Judith has a history in receptionist duties, having previously been the receptionist at a doctor’s surgery. Judith joined us in 2012 when we opened our Allendale surgery but decided to retire in October 2017. Obviously the draw of working with all of us was too much so Judith now helps out mainly in Allendale for holiday cover or occasionally when we are short staffed. Judith kept Great Danes for years so is well used to dealing with big dogs and reckons they are easier to handle than the occasional feline terror that comes in the door. She has now down-sized to a Wheaten Terrier called Finnegan, 2 labradors and Brian the rescue cat. Rachel carried out a vetting on a horse for us on 19th April. We were travelling a long distance, didn't know any vets in the area but were recommended to contact Old Stone Vets. I am so glad that we did. What a professional and friendly practise, from the lovely lady on reception through to Rachel who did a fantastic job at the vetting. She had taken on board exactly what we were looking for in our potential new horse, and tailored the vetting exactly to suit that. We are delighted that the beautiful horse flew through the vetting and is now home with us. It gave us a lot of confidence having someone so knowledgeable and thorough as Rachel carrying out the vetting and we would recommend her and Old Stone Vets to anyone needing either a horse vetted or who needs a first class equine vet for their horses.